A group of monks from Mount Kōya comes near Abeno in Settsu Province (or Toba in Yamashiro Province) on their way to Kyoto. Then the monks notice an old homeless woman sitting on a rotten wooden stupa*. This old woman is the famous Ono-no-Komachi, once renowned as a raving beauty and for having a number of love affairs. Since the leader monk assumes that sitting on a stupa is disrespectful to Buddha, he starts preaching her to move away from it. However, the old woman replies with words pregnant with deep meanings and talks the monk down at the end. Learning that she is not an ordinary woman, the monk accords his every courtesy to her. The old woman confidently creates and recites a poem and impresses the monk even more deeply. When the monk asks her name, she reveals finally that she is the lady once called Ono-no-Komachi. She reminisces about her youth when she was stunningly beautiful and bemoans her current aged self. Then, she goes frenetic because the vengeful spirit of Fukakusa-no-Shōshō (Shii-no-Shōshō), who once loved her, possesses her. In the past, when he confessed his love to her, she told him to visit her for 100 nights and if he could complete this mission, she would accept his love. Shōshō visited her every night until the 99th night, but he passed away before completing the last one night. Since he could not be successful in his mission of love, the obsessed ghost of Shōshō curses and afflicts the aged Komachi. In a demonic state, Komachi restages the scenes when Shōshō visited her every night. Eventually she regains her sanity, tells humans that they should pray to become a Buddha after death, and she determines to live in order to reach enlightenment. *stupa: Stupa was originally a sacred mound where the Buddha’s bones were interred. In later ages, towers in the shape of this mound were made in areas where Buddhism spread. These towers were also called ‘stupa’ and considered the embodiment of the Buddha’s body. As a result it became an object of worship. Eventually, a stupa also came to be used as a grave marker or a tower to commemorate the deceased. It was also built as a route marker for pilgrims, and the stupa Komachi sits on is one of those. 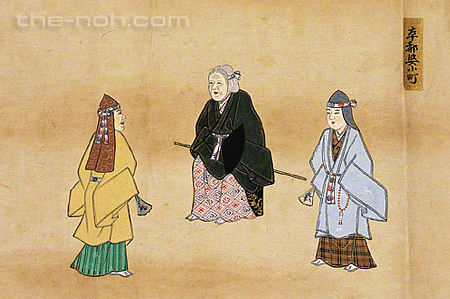 This is one of the five pieces in the “Rōjo-mono (Old Women)” category, including Sekidera Komachi, Higaki, Obasute, Oumu Komachi, and this one, Sotoba Komachi. These pieces in the Old Woman category are considered outstandingly difficult to perform for Noh actors. They all focus on the theme of “aging” that every living thing must face one day. Their stories consist in drawing your mind to the issue of what your life is, are rich philosophically, and have deep religious connotations. Unlike most of the Old Woman’s pieces that are quiet and less active, Sotoba Komachi is filled with motion, and therefore is fun to watch even for audiences who are relatively new to Noh. There are many highlights in this piece. First of all, the main part in the first half of the drama, the dialogue between the monk and Komachi, is outstanding. Finding her sitting on top of a sacred stupa, the monk tries to preach to her for paying respect to it. However, she preaches back to him by saying that the mercy of Buddha is profound, and not as shallow as what the monk believes. The audience must be impressed with the old lady who acquired wisdom as she aged. 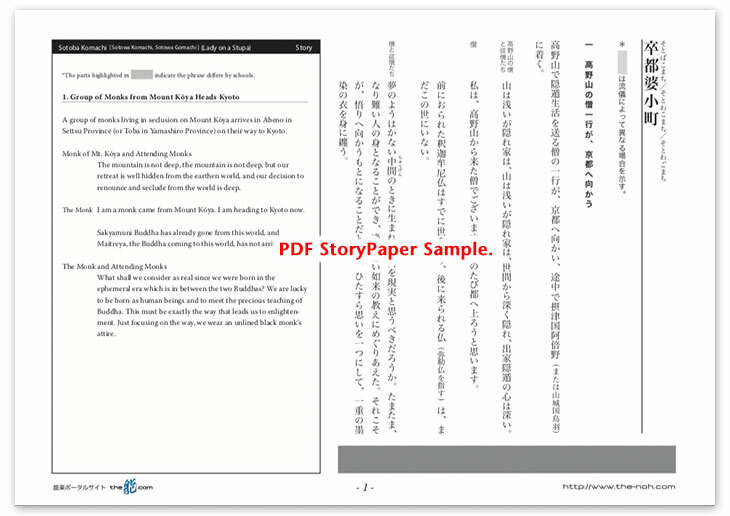 Then the story skillfully develops to illuminate the difference between the celestially beautiful Komachi in her early life and aged ugly Komachi at present, which vividly describes the sadness and irony of life. Then, the audience witnesses the dramatic change of the scene that describes Komachi driven to insanity. She suffers the consequences of her past deed when she tossed around Fukakusa-no-Shōshō, a man who loved her. But rather than expressing her suffering in karma, the scene seems to describe how she enjoys the memory of his deep love for her, which was passionate enough to drive him to hold a grudge. The scene where Komachi transforms into Shōshō and describes their past love story is very touching. While the story explains profound philosophy in Buddhism, it is also simply interesting as a tale. The audience will feel refreshed after watching this drama despite the fact that it describes the heavy theme of aging. No detailed record exists about Ono-no-Komachi, the lead character of this drama, but it is said that she lived sometime around the middle of 9th century to early 10th century in the Heian period of Japan (794-1192). She was a talented poet. Her extreme beauty is also famous and even well recognized in later ages.